B&O BeoPlay A6 review | What Hi-Fi? For £800, you can usually buy a pretty good hi-fi streaming system of humble proportions: a Cambridge Audio Minx Xi system, pair of Q Acoustic 3020 speakers and speaker stands, for example. But it can’t buy you space in a room, and if that’s what you’re lacking, an all-in wireless speaker like the B&O BeoPlay A6 could be – and possible should be – where you turn next. At this price, the Naim Mu-so is perhaps its only real competitor. The Naim won our hearts and evidently those of our What Hi-Fi? readers too, as it picked up the 2015 Readers Award, and has had the privilege of walking pretty freely at this price point. Far from a one-source wonder, the A6 will stream pretty much anything from almost anywhere and in any way you like – whether it’s music from your iPhone over AirPlay, tablet via Bluetooth, your NAS drive over DLNA, or from the catalogues of built-in streaming services such as Deezer and Spotify. If you’re more of a radio listener, there are thousands of internet stations at your fingertips via TuneIn too. All popular file formats (MP3, AAC, WMA, ALAC, FLAC, WAV) are supported, up to the high-resolution 24bit/192kHz too. With multi-room up its sleeve, it can also pair with another A6, its big brother the A9, or even B&O’s Beovision Avant and Beovision 11 TVs. If you’ve seen the discus-shaped A9, you might expect its little sibling to follow form as a miniature version. But B&O throws a curveball. If the Iron Giant had a boomerang, it may look something like the A6. The distinctive shape is key to the angling of the five drivers: two 14cm woofers (driven by two 60W amps) and a pair of 20mm tweeters (driven by two 30W amps) firing front-ways, as well as a 38mm full-range driver (at the hands of 60W amplification) firing backwards – designed to bounce sound off the back wall for a greater sense of spaciousness. That’s why the white back panel is perforated: to let sound out. You can’t see the drivers though, because B&O has pulled wool over our eyes, quite literally. B&O has teamed with design Danish textiles manufacturer Kvadrat to produce what can only be described as a fuzzy wool-like front, claiming that the delicate weaving pattern of the multi-coloured threads not only produces a look of luxury, but acoustic transparency too. With a range of colours thoughtfully designed to match your living room, including light grey (pictured), dusty blue, dark rose and dark grey, the neat seam-like decoration across the front makes it look all the more homely. As with the A9, the A6 features discreet tap and swipe controls on top. Brush your finger along to change volume, and tap the middle to switch it between playback and standby mode, the right to change input, and left to turn it on or off. Hats off to B&O for creating such a neat and well-integrated control system, although we sometimes find ourselves pressing things twice, and having to tap quite precisely too. 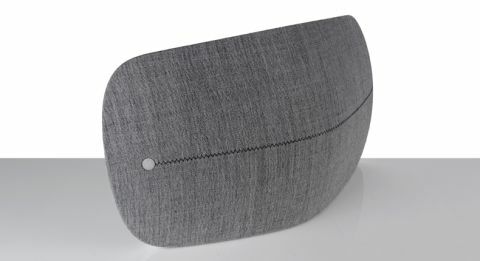 In an ideal world, no one puts the BeoPlay in the corner. But if needs must, there’s settings – ‘Free’, ‘Wall’ and ‘Corner’ – to optimise performance based on placement in a room, activated by a simple flick switch underneath the unit. As it’s located in a deep-seated panel, you’ll need to tip the unit upside-down to access it – and the power, Ethernet, 3.5mm input and service-only USB sockets. In all honestly, it’s a bit fiddly manipulating wires to get to them. To get it joined to your network, going down the more stable wired route means simply plugging in the Ethernet cable – the orange-flashing network indicator turns solid white when it’s connected. Those intolerant of trailing wires will need to connect the A6 to their network over wi-fi by first connecting a smartphone or tablet to the A6’s wireless network and then following the steps on the BeoSetup app (free on iOS and Android devices). It’s straightforward enough and only takes a matter of two or three minutes. Either way, the BeoMusic app gives you control in the palm of your hand. While you’ll use your mobile for Bluetooth and Airplay and Spotify for direct streaming, it’s your portal to internet radio and songs stored on your network. It works fine, but it’s too ordinary – when you’re spending £800 on a speaker you want something slick and nice to use. Its plain blue interface looks unfinished (in a way, we almost hope it is) and scrolling through a 3000-song music library takes a while. The bottom line: it needs to be better. The last thing you might expect from a product this slender is deep, rumbling bass, but B&O surprises us again. When the beat drops in Macklemore & Ryan Lewis’ Downtown (streamed over Bluetooth), it’s not only deep-rooted but defined and textured too – more so than through the Mu-so, in fact. Move up to midrange and this is where the A6 excels. Hurling Macklemore’s vocals into the spotlight with clarity and focus, it rolls with the eccentric rap’s tempo changes and sweeping dynamic dexterity. It captures his charismatic spin, and the smooth, melodic vocals that make up the chorus’ catchy hook. With highs (in this case, bells) clear and refined, the BeoPlay serves up a fine tonal balance that values clarity and crispness, although is just nipped for solidity by the Naim. Spacious and capable of filling the largest room in the house, its presentation is energetic and fiery too – just what a song like Downtown relies on to get you onto the dancefloor. Every instrument – even finer-spun sound effects – is accounted for, and although there’s a lot going on in the borderline-bonkers song, it compartmentalises each section and gives it space without compromising cohesion. While the Naim Mu-so is a more fluid listen, better timed and with a tighter hold over the chronic piano cadence, the A6 tugs the rope back with more mid expression and bass insight. Both excel – and one-up another – in different areas. Use Bluetooth for offline streaming when you can; here, Airplay makes music sound a bit more confined and less insightful. However, playing high-res songs over the air (or Ethernet wire) gets the best from the A6, which is a good sell for investing in them. It doesn’t flinch with low-res streams either. Play David Gilmour’s Boat Lies Waiting over Spotify Connect and although you can hear the compression it remains an open, informative listen: pianos are lifelike, strings swell and layered vocals fill the room. The A6 works best out in the open, although backing it against a wall isn’t a bad option when the ‘Wall’ setting is on – drawing out what becomes a fairly overbearing bass, it restores tonal balance. If you’ve got almost a grand to spend and are after a very good sound and the simplicity and convenience of a one-box, it’s the BeoPlay A6 (alongside the Mu-so) you should be looking at. It’s stylish, sounds as good as it looks, and although we’d prefer more substantial controls and a better app, it’s a job well done in our eyes. We want one and think you will too.